I’ve seen a lot of oil tanks over the years, but never before have I encountered such ragged, faceted approximations to cylindrical form. These lumpy, polyhedral tanks suggest that in this little corner of industrial New Jersey, π has a value somewhat smaller than 3.14. 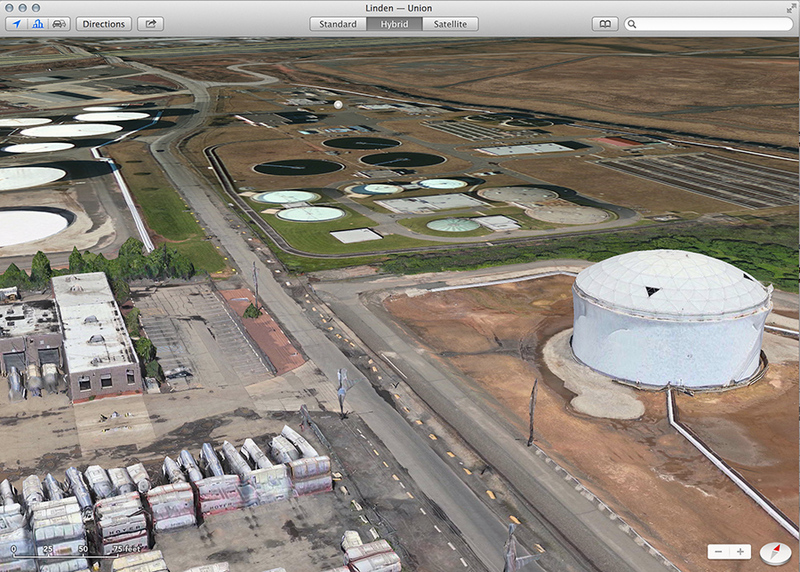 Here’s another example, from a tank farm in Carteret, New Jersey, just across the Arthur Kill from Staten Island. 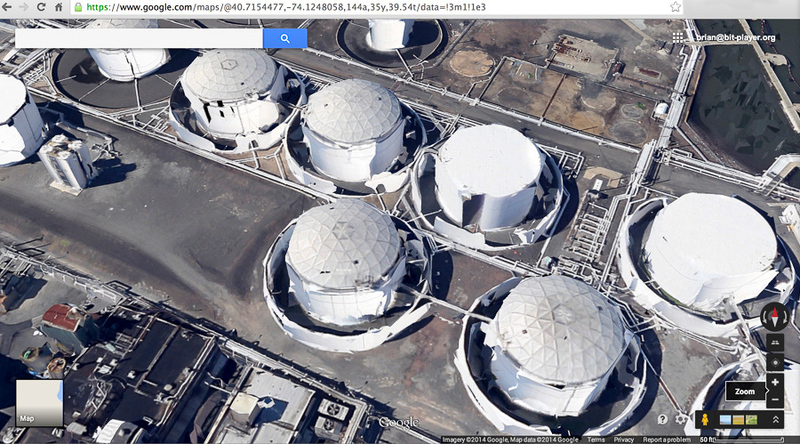 This time we’re looking down on the tanks from directly overhead. The image at left was captured as soon as the scene appeared on screen; at right is the rounded-out version that emerged a few second later. The software, again, is Apple Maps. 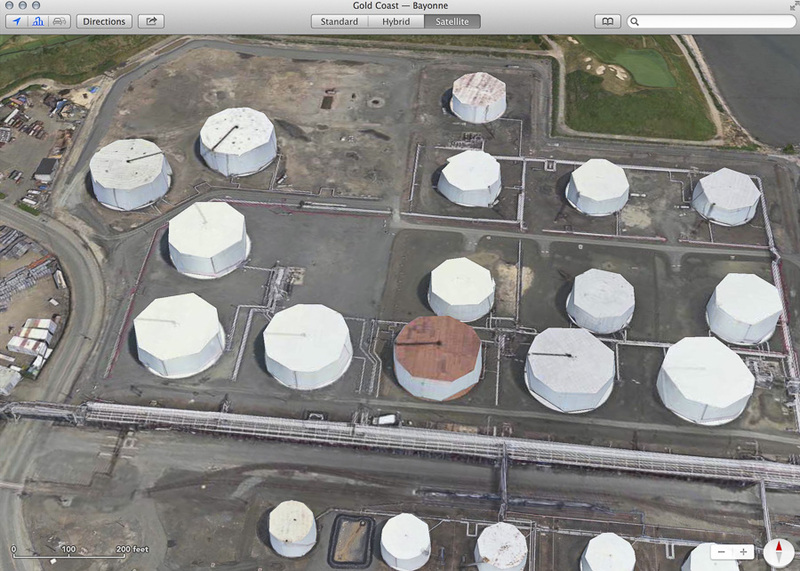 The mangled petroleum tanks in this image are in Kearny, New Jersey, a few miles north of Bayonne along the Passaic River. 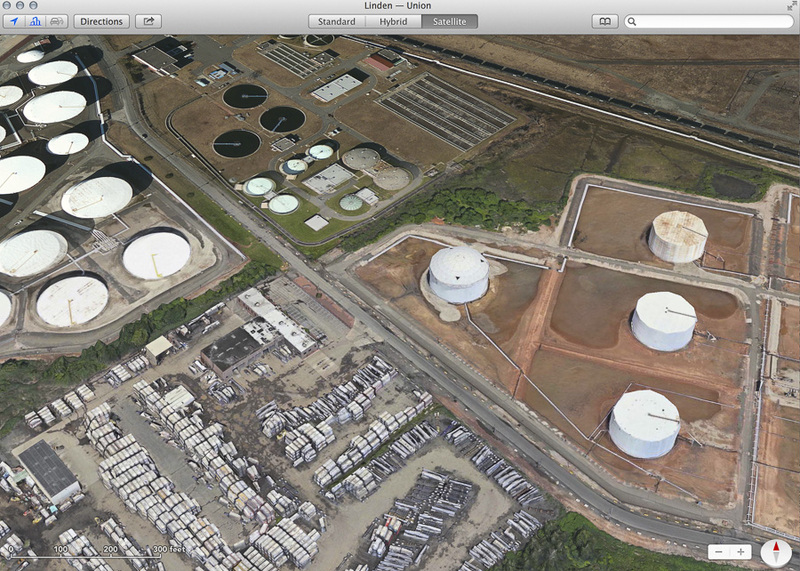 In this case the picture was taken by Google’s eye in the sky, not by Apple’s. The distortion is different, but no less disturbing. Now it’s not just the geometry of the cylinders that has gone goofy but also the topology. Some of those tanks won’t hold oil (or any other fluid); they have holes in them. And notice how the spill-containment walls surrounding the tanks also look moth-eaten. Toward the right side of the image we see more cylindrical tanks, some with faint, remnant traces of polyhedral approximation. But when your glance wanders to the upper left, you find that the world suddenly loses all depth. The tank farm over there, and the water treatment plant at the top of the frame, are merely painted on the landscape—trompe l’oeil structures that don’t trompe anyone. This image offers another view of the same Linden landscape, looking obliquely to the west or northwest. The road that runs through the scene from foreground to background, crossing the New Jersey Turnpike at the very top of the frame, is Tremley Point Road. Suppose you were driving west along that road. Just beyond the row of lumpy trees that extends from the left edge of the image toward the road, you would cross a mysterious boundary, leaving behind the pop-up 3D world and entering flatland. What would happen to you there? Would you be pancaked like those tanks, reduced to a two-dimensional object painted on the pavement, with a painted shadow to accompany you? 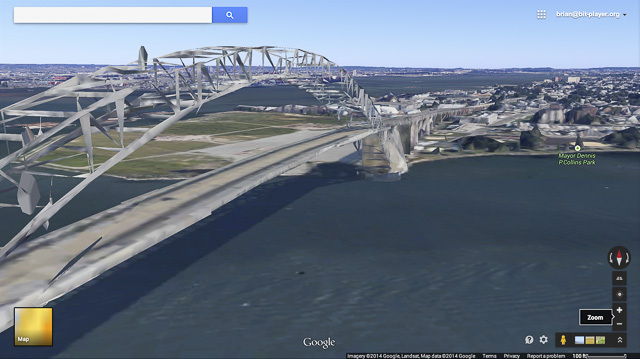 In calling attention to these oddities in online map imagery, my aim is not to mock or belittle. To me, these maps are one of the marvels of the age. A century ago, it was a huge novelty and liberation to soar above the earth’s surface for the first time, and see the landscape spread out below as if it were a map. It’s no less remarkable that we have now transformed the experience of looking at a map into something like flying an airplane. The first “satellite view” maps were just that: montages of images made from hundreds of miles above the earth’s surface, looking straight down. They portrayed the territory as an array of pixels, assigning an RGB value to every (lat, lon) pair on the surface of a sphere. The next step was to add a digital elevation model, giving each point on the surface a z value as well as a color. This scheme allows us to gaze obliquely across the landscape and see a realistic rendering of mountains, river valleys, and other natural landforms. It works well as long as you don’t try to get too close: the model is well-suited to forests, but not to trees. And it doesn’t work well at all for manmade artifacts. In representing engineered structures, one weakness of elevation maps is that any reasonable scheme for interpolating between sample points will tend to round over corners and sharp edges, so that buildings become lumpish mounds. Symmetries are also lost: the sampling fails to preserve the rectilinearity or circularity of the various objects we strew around the inhabited patches of the world. And the biggest problem with an elevation map is that it’s a mapping in the mathematical as well as the cartographic sense. The surface of the planet is defined by a smooth, single-valued function, assigning a unique elevation z to every (lat, lon) point on the sphere. Any line radiating from the center of the earth must cross that surface in exactly one point. As a result, there can be no vertical cliffs and no overhangs. Also no bridges. 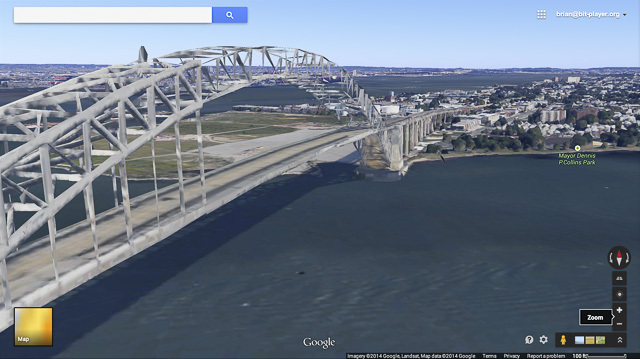 The surface defined by the elevation model can go under a bridge or over it, but not both. The latest mapping programs are apparently addressing these issues by building explicit three-dimensional models of selected landscape features. I see evidence of several different techniques. The Bayonne Bridge model that assembles itself in the four frames above is clearly based on a triangulated mesh: all the surfaces making up of the envelope of the structure are decomposed into elementary triangles. The cylindrical tanks in the Apple Maps images seem to grow their circular form through an Archimedean process, in which a circle is defined as the limit of an n-gon as n goes to infinity. Elsewhere, I think we may be seeing some kind of spline curves or patches. 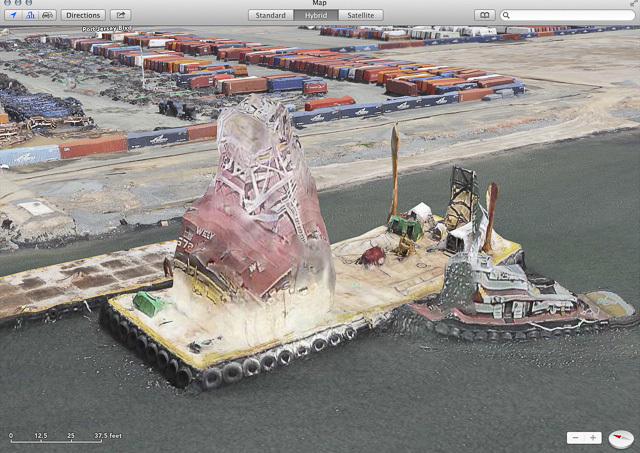 What we’re seeing here is apparently a tugboat nudging a barge equipped with a crane. The matching of surface pattern to three-dimensional form has gone badly awry, which gives the whole scene a toylike quality. I find it charming. In future years, when the Maptrix has become a hyperrealistic, real-time virtual world with day and night, weather and seasons—maybe with inhabitants who wave back at you—we’ll wax nostalgic over such quaint foibles. This entry was posted in computing, modern life, photography. I love the idea of the “Maptrix” - nice coinage! Presumably it’s not a coincidence that your illustrations here are not the Taj Mahal or the Chrysler building, but the less glamorous supporting constructions that you explained and described in the wonderful Infrastructure book? You’re quite right: not a coincidence at all. For the past few months I’ve been working on a new edition of the book (due out in October). Not that I’m uninterested in other kinds of landmarks—and your comment inspired me to go have a look. I’m sad to report that the Taj Mahal remains flat as a pancake in both of the mapping programs, but the Chrysler Building is pretty spectacular. 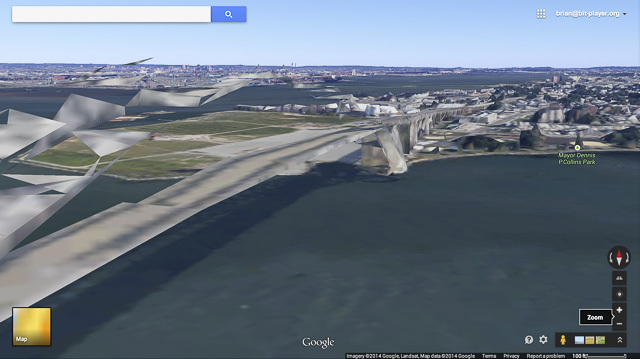 In Google Maps you can fly right through it. Flying right through is the very definition of a glitch in the Maptrix. Though the weird, quasi-organic tugboat and crane score pretty highly too. Looking forward to the new edition of Infrastructure. Two questions from the UK: when’s it out here, and have you managed to squeeze in any more European/global content? Turns out you can look right down the spire of the Chrysler building, but you don’t get to see any of the glorious Art Deco interior. Instead it’s stuffed with trees and apartment buildings from who knows where. How do you fly through the Chrysler building? I seem to only be able to look at it from above (geometrically symmetrical). Google’s street-level view has plenty of anomalies of its own, but the skyscraper fly-throughs take place from the aerial perspective. When I click on the link in George M’s comment, I’m taken to position in three-space where I’m inside the Chrysler Building spire and looking straight down the hollow interior of the building. If I mouse around a bit, I can move in and out of the building. I can also soar over to 34th and Fifth to play with the Empire State Building. If all this isn’t working for you, I’m not sure how to explain it — but I have a suspicion. There are (at least) two versions of Google Maps: “new” and “classic.” (That naming scheme didn’t go well for Coke, if I remember correctly.) All the gee-whiz stuff appears only in the “new” version. Perhaps you’re a “classic” user. Switching back and forth is not as easy as it might be. From the “new” screen, a gear icon near the bottom right offers the option of returned to “classic.” From “classic,” when I visit the main URL https://maps.google.com, I’m offered the choice of trying the new version, but I don’t know if that offer is universally present. It might depend on the browser you’re using, on whether certain cookies are present, on whether you’re logged in to a Google account, and so on.